We’re careening towards to the end of the semester in calculus, and I know I’m mostly posting about stats, but this just happened in calc and it applies everywhere. We’ve been doing related rate problems, and had one of those classic calculus-book problems that involves a cone. Sand is being added to a pile, and we’re given that the radius of the pile is increasing at 3 inches per minute. The current radius is 3 feet; the height is 4/3 the radius; at what rate is sand being added to the pile? Never mind that no pile of sand is shaped like that—on Earth, anyway. I gave them a sheet of questions about the pile to introduce the angle of repose, etc. I think it’s interesting and useful to be explicitly critical of problems and use that to provoke additional calculation and figuring stuff out. But I digress. Mercator projection of the World (also a handout students used). 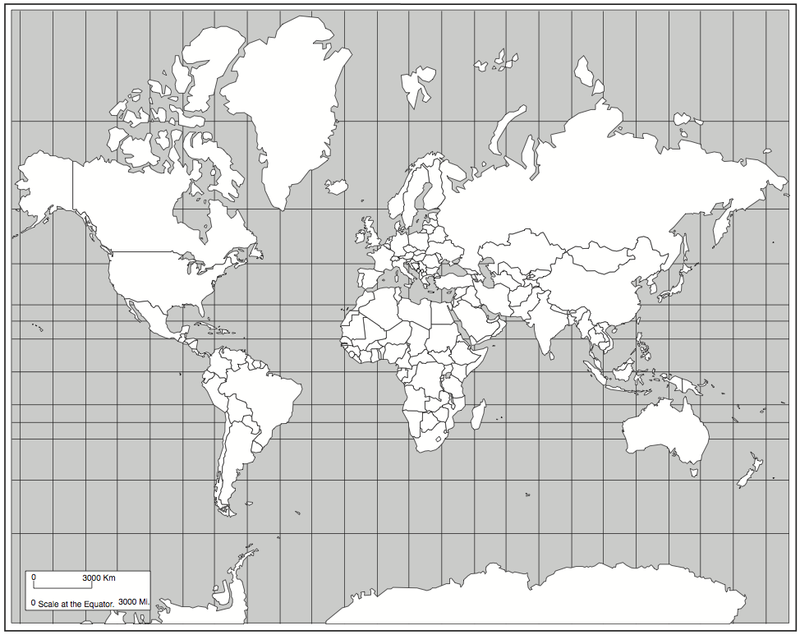 Basic grid spacing is 15°, but it includes the tropics of Cancer and Capricorn so don’t be deceived. You really don’t want to read all the details. But among the crucial steps in getting the lesson outlined last time to work right, the crucialest might be the place where the students figure out that the y-scale goes as the secant. How do we help them figure that out? (And what do we mean by that?) That’s what we’ll talk about today. First of all: that y-scale is the number of centimeters per degree in the y-direction, and that depends on latitude. And when you look at a Mercator-projected Earth (like the one in the figure) you can see that this scale increases with latitude. How do we know? Because the lines of latitude get farther apart. So more centimeters per degree. Capybara. 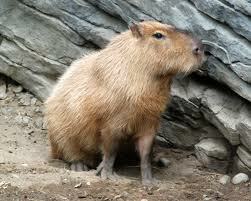 The world’s largest rodent. I’m writing a paper for a book, and just finished a section whose draft is worth posting. For what it’s worth, I claim here that the book publisher (Springer) will own the copyright and I’m posting this here as fair use and besides, it will get edited. Modeling activities exist along a continuum of abstraction. This is important because we can choose a level of abstraction appropriate to the students we’re targeting; presumably, a sequence of activities can bring students along that continuum towards abstraction if that is our goal. What are the dimensions of the Queen’s two pet pens? The Queen wants you to use a total of 100 meters of fence to build a Circular pen for her pet Capybara and a Square pen for her pet Sloth. Because she prizes her pets, she wants the pet pens paved in platinum. Because she is a prudent queen, she wants you to minimize the total area. a. Each pair of students gets 100 centimeters of string. They cut the string in an arbitrary place, form one piece into a circle and the other into a square, measure the dimensions of the figures, and calculate the areas. Glue or tape these to pieces of paper. The class makes a display of these shapes and their areas, organizes them—perhaps by the sizes of the squares, and draws a conclusion about the approximate dimensions of the minimum-area enclosures. b. Same as above, but we plot them on a graph. A sketch of the curve through the points helps us figure out the dimensions and the minimum area. Using Fathom to analyze area data. Sliders control (and display) parameter values. I have suppressed the residual plot, which is essential for getting a good fit. 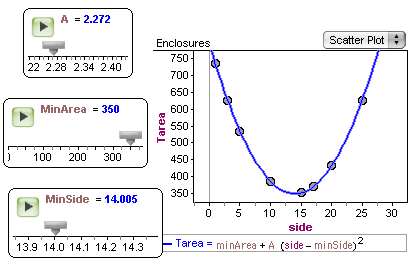 c. This time we enter the data into dynamic data software, guess that the points fit a parabola, and enter a quadratic in vertex form, adjusting its parameters to fit the data. We see that two of these parameters are the side of the square and the minimum area. d. Instead of making the shapes with string, we draw them on paper. Any of the three previous schemes apply here; and an individual or a small group can more easily make several different sets of enclosures. Here, however, the students need to ensure that the total perimeter is constant—the string no longer enforces the constraint. Note that we are still using specific dimensions. f. We make a diagram, but use a variable for the length of a side. Using that, we write expressions for the areas of the figures and plot their sum as a function of the side length. We read the minimum off the graph. g. As above, but we use algebraic techniques (including completing the square) to convert the expression to vertex form, from which we read the exact solutions. In this version, we might not even have plotted the function. h. As above, but we avoid some messy algebra by using calculus. Now let’s comment on these different versions.